Does the river Don look like a Bishop’s crosier, where it streams past the Cathedral? Did Columba (521-597) ask his disciple St Machar to set up a Cathedral or was that on instruction from God? And is William Wallace’s arm really buried in the Cathedral Wall? And why is it called a Cathedral, when there is no Bishop? And why does the building look back to front? These are just some of the questions and legends that we have and can explore and about which there has been much dispute and even fighting. The Celtic Saint, St Machar was indeed a disciple of St Columba and St Machar's Cathedral is named in his honour. A place of worship was established in this area about 580 AD and it is highly likely that it was indeed on its current location. A stone carved with a Celtic cross - a clear indication of the site’s Celtic roots - believed to have been associated with this original church is now on display in the church. It became a Cathedral in the 1130s when the seat of the Bishop was transferred from Mortlach, near Dufftown to Old Aberdeen under David I. By 1165 a Norman style cathedral stood on the site. In the 13th century the Cathedral had to undergo extensive restoration. This was started under the instruction of Bishop Cheyne (1282 to 1328). We have to thank him that the building turned out to be a fine example of a fortified Kirk. In 1305 Sir William Wallace was hung, drawn and quartered and his dismembered body was sent to different parts of Scotland. Whether his left arm was indeed interred within the walls of St. Machar's it is not known. 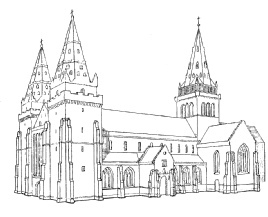 What we do know is that shortly after the war of independence - which left its mark not just on Aberdeen (Edward III sacked it in 1336), but also on the Cathedral - construction was continued under among others Bishop Alexander Kinnimund (1355-80) and Bishop William Elphinstone (1431-1514). In his lifetime the cathedral was constructed to its biggest form. The nave and towers on the west - which form the modern church were only one part. To the east of the nave, there was a crossing which had one large central tower. There was also a choir to its east and transepts pointing north and south. In 1520 a ceiling of panelled oak bearing 48 heraldic shields was commissioned by Bishop Gavin Dunbar (1518-1532). It must have been a glorious sight when the Church was finally complete in 1530. It is thought that nearly 30 canons - each with their own manse - performed the religious and practical duties at the Cathedral. St Machar’s had a key role in the political but especially in the spiritual life of the North-East of Scotland. With the reformation of 1560 change came. The Cathedral lost its status as cathedral. Its treasures were taken and its land sold. Once immediately before and during the reformation and then later when the conflict with Charles I escalated, it recovered its cathedral status. This also sheds some light on the question why St Machar’s is referred to as Cathedral. While it is a part of the Church of Scotland, a Presbyterian church, which has neither bishops nor cathedrals, St Machar's is a cathedral only by name: The Cathedral Church of St Machar. This seemingly trivial distinction is nevertheless a reminder of serious conflicts which more than once in the in the middle of the 17th century led to civil wars that engulfed Scotland, England and Ireland. General Monck led Cromwell's troops into Aberdeen in 1654. Looking for material for his fort he removed the stones from the empty and destroyed bishop's palace to the east and from the disused and probably never finished choir. It is not clear if this led to a weakening of the base of the central tower. A storm in 1688 caused its fall into the transepts and crossing, and damaged the nave as well. It took until 1953 to bring the east end into the state that it is today complete with three stained glass windows.